Cooks in 20 minutes min. Grill the slices of baguette in the oven on 150°C until crunchy and golden brown. Carefully brush the clove of garlic over the toasts for a slight garlic flavour. Sprinkle the toasts with a little olive oil. Mix the cream cheese with feta. Season the cheese with black pepper and mint. Add a dash of lemon juice if desired. 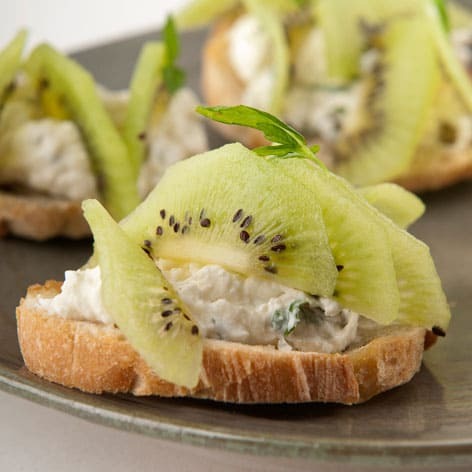 Coat the toasted bread slices with cheese and cover nicely with Zespri Green kiwifruit slices. Garnish with some small leaves of mint.